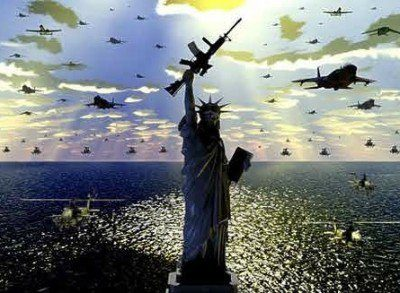 According to this report, during the entirety of the Cold War, the largest nuclear weapons powers in the world, the Soviet Union and United States, were able to avert World War III due to massive and elaborate radar and electronic surveillance systems able to detect missile launches from anywhere in the world—but all of which was effectively rendered obsolete last year when the United States announced it was militarizing space—a move Russia warned about by declaring “a military confrontation in space may be as dangerous as the nuclear arms race set off by Washington in the middle of the last century”. 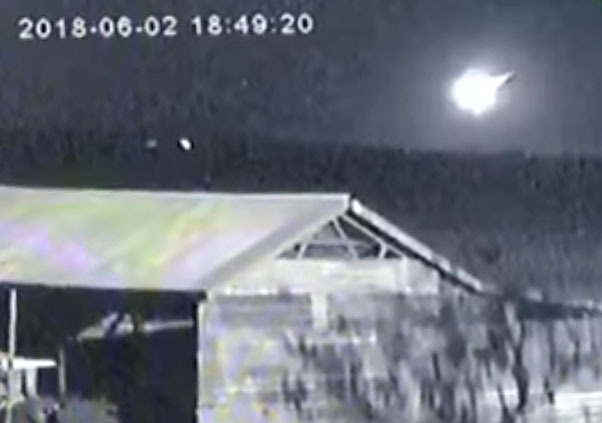 To how catastrophically dangerous the militarization of space really is, this report explains, was evidenced on 2 June 2018 when a very small space rock called 2018 LA exploded over the African nation of Botswana—that was first detected by the Mt. Lemmon Survey at 08:14 UT—just 8½ hours before it entered the atmosphere near the border of South Africa and Botswana at 16:44 UT—and where it grew into a spectacular fireball, with witnesses describing it as equal to the Sun in brilliance, and was accompanied by thunderous explosions—a near exact description of an air burst nuclear weapon detonation. With our planet’s best space object detection systems being only able to give barely 8-hours of warning time between the discovery of space rocks hurtling towards us and their nuclear weapon-like detonation in our atmosphere, this report continues, most critical to note is that this only applies to space rocks detected during the night—but does not protect us from space rocks approaching from the “day side” of Earth, as they would be invisible because the Sun’s light would stop us from seeing them in time to give warning. 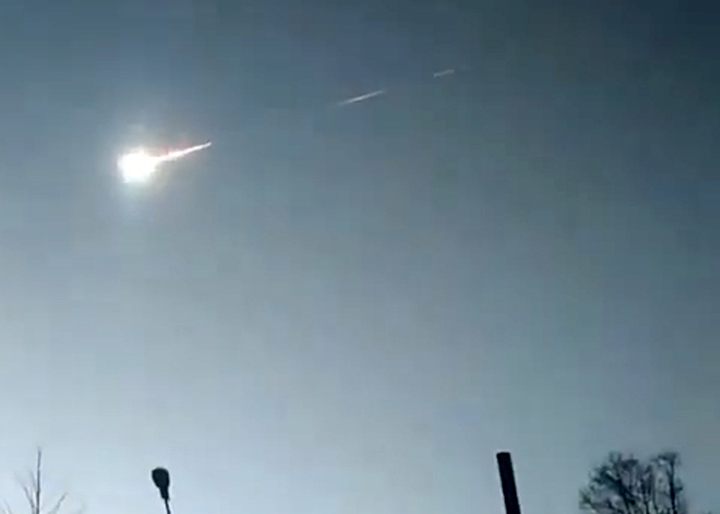 Knowing the grave danger they faced should an undetected space rock explode like a nuclear bomb over the Russian Federation, this report details, near immediately after the Botswana space rock explosion on 2 June 2018, the US Navy recalled all of its aircraft carrier battle groups to their home ports in the United States—a tension lessening move designed to demonstrate to Russia that they weren’t preparing for war—and whose prescient value of demonstrated itself on 18 December 2018 when an undetected daylight space rock exploded close to Russia’s Kamchatkapeninsula with a force ten times more powerful than the Hiroshima atomic bomb—on 15 March 2019 when another undetected daylight space rock slammed into Russia’s Krasnoyarsk region with local reports saying it “warmed the air” and “shook the ground” after streaking across the sky in a green, yellow and orange fireball—and on 7 April 2019 when yet another undetected daylight space rock exploded over the Russian military-industrial city of Krasnoyarsk causing great fear and panic. 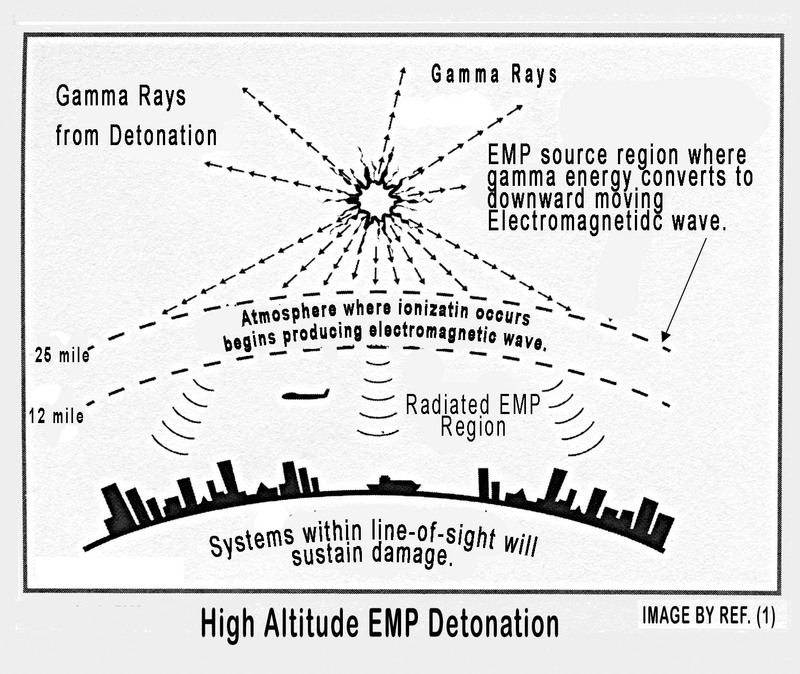 In the beginning minutes of World War III, this report fearfully documents, both Russian and United States nuclear first strike doctrines call for the use of air burst nuclear weapons over each other’s main military bases and industrial cities—the strategic intention of which is not to cause massive civilian casualties, but to initiate what is called an electromagnetic pulse (EMP) designed to destroy electronic infrastructure and communications—which would look and feel exactly like space rock atmospheric explosions—with the critical difference being between a failed EMPnuclear blast, due to damaged electronics and/or computer malfunction, and a space rock blast, being the immediate assessment of each other’s war intentions. 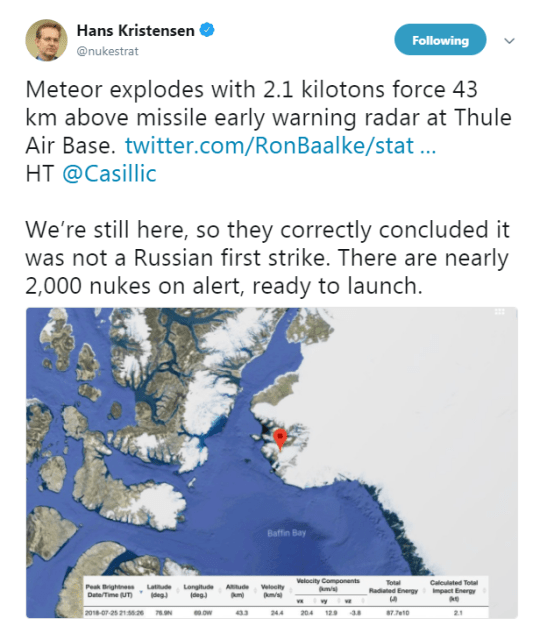 With this past 4-months onslaught of undetected daylight space rock explosions over the Russian Federation, this report continues, rapid assessments were able to be made by the MoD not to launch retaliatory nuclear weapons first strikes—most crucially because the US Navy was keeping all of its aircraft battle strike groups in their home ports—but whose future rapid assessments of can no longer be made because of the US war stance that began to change on 28 March 2019 when the USS Harry S. Truman (CVN-75) aircraft carrier battle group left port, on 1 April 2019 when the USS Abraham Lincoln (CVN-72) aircraft carrier battle group left port, on 8 April 2019 when the USS Theodore Roosevelt (CVN-71) aircraft carrier battle group left port, on 9 April 2019 when the USS Dwight D. Eisenhower (CVN-69) aircraft carrier battle group left port—all of whom then joined the aircraft battle groups USS John C. Stennis (CVN-74) and USS Nimitz (CVN-68), who were already at sea patrolling US territorial waters—and all of whom now are quickly positioning themselves throughout the world’s sea lanes in the greatest war-strength move seen since the 2003 American invasion of Iraq. 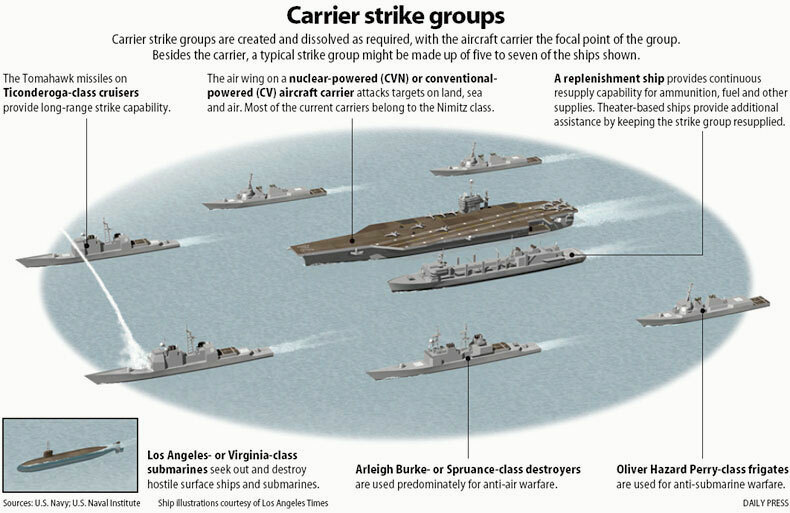 As the United States has rapidly flooded the world’s oceans in less than 3-weeks time with all of its available aircraft carrier strike groups, this report grimly concludes, the question of if the United States is going to war is no longer a question, only against whom they’re planning to attack—with the two most likely targets being Iran, whom the US has now laid the legal groundwork for attacking—and Venezuela, whose US “invasion planners” have just concluded a secretive meeting about—but whose insane possibility of attacking Russia cannot be ruled out as Russiannaval forces continue monitoring US Naval forces nearing the southern border, and whose war provocations Russia has already warned it will “react accordingly” to—all of whose volatility is occurring when, for the first time in modern history, the United States has ceased virtually all military-to-military communication with Russia established so each could know the other’s intentions—thus meaning that even the smallest space rock exploding over the Russian Federation, now has the ability to ignite World War III. April 15, 2019 © EU and US all rights reserved. Permission to use this report in its entirety is granted under the condition it is linked back to its original source at WhatDoesItMean.Com. Freebase content licensed under CC-BY and GFDL. At 22:59 Moscow time (20:00 GMT) on 17 September, however, this report notes, Russian military forces in Syria were notified by the Israelis that they were launching aircraft to attack an Iran-Hezbollah weapons depot near Damascus airport—but one of whose fighter aircraft, at 23:00 began firing its missiles at the Syrian port city of Latakia killing, at least, two people. Equal Air Time for Child Molesters!